Their paradigm case of a practice not justified along these lines is sending kids to private school. That confers an advantage that interferes with equal opportunity and isn't necessary so that parent and child can enjoy an intimate, mutually satisfying family life. Bedtime stories, they say. I'm not so sure. 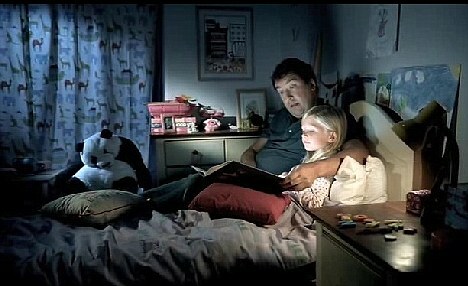 Possibly I could have as much quality, intimate time with my kids if we watched a little TV before bed. But let's let that pass. Bedtime stories are in. Going to museums. This confers an educational advantage, but maybe it passes muster, if my child and I love being together at museums in a way we don't love being together at, say, a bowling alley. Traveling to national parks. There's definitely an educational advantage conferred, but it might be OK, since vacation time does generate family intimacy, and I just can't enjoy Disneyland in the way I can enjoy a national park. A lot will not get validated. Buying high school students laptop computers so they can easily manage schoolwork, access online assignments, etc. The computers confer an advantage and aren't necessary for family intimacy. Yes kids appreciate the gift, but only briefly so, and laptops actually tend to make kids retreat from the family. Music lessons. All advantage, not a lot of intimacy, considering the stress over the years about practicing, performing, etc. I have felt bad over the years about conferring advantages, but haven't had the view that the authors put forward: that it's wrong for parents to confer advantages on children, except when required for intimate family life; and that the state would be entitled to prohibit parents from conferring advantages like those in the second group. There is a milder judgment one could make: that collectively we should make up for or avoid the inequalities. Schools should give kids access to computers. Colleges should get rid of "early decision." There should be cheap music lessons in public schools. I'm for all of those kinds of solutions, but should I go farther and admit to wrongdoing, to the extent that I've offered my kids advantages that aren't needed for intimate family life? Though not a libertarian, I am drawn to what many libertarians say about the family. My personal liberty to spend my own money includes liberty to spend on my kids, because "children themselves form part of one's substance." They "form part of a wider identity you have" (Robert Nozick, The Examined Life, p. 28). If I may buy myself a laptop and thereby have advantages over other workers (Brighouse and Swift don't say otherwise), I'm very tempted to think I can also buy my kids a laptop. The worry that all kids ought to start life on an equal footing falsely presents kids as totally distinct from their parents. But that's a huge thing to try to argue, especially in a quick blog post. I have a more modest objection to what Brighouse and Swift are saying about when it's OK to confer advantages. Suppose I have all sorts of money to spend on laptops, books, education, and whatnot, for myself. I may secure those advantages for myself; presumably I'm entitled to them, on their view. What kind of family life would I have if I bought myself a laptop and then told my kids they couldn't have one, because they needed to remain on a level playing field with other children? Imagine this happening again, and again. "X is fine for me, but not for you!" Conferring advantages (without an intimacy payoff) may actually be necessary for a family life that's internally harmonious and egalitarian. An alternative would be that I don't get to have a laptop either, but that would put an awfully heavy burden on parents. Do they really have to make themselves less competitive at work, once they have kids? Surely there are some ways of conferring advantage on children that are illegitimate (I can think of several that amount to outright cheating). I'm just not entirely convinced that as many things are illegitimate as the authors claim. My son got music lessons. First of all, all his mother's family are musicians, except his mother. now is, suprise, a musical producer and performer. I agree that there are extreme cases where parents "buy" their children's way to a privileged future, and that's wrong, but maybe a better idea than laying down stupid rules would be to work towards a society with fewer privileges and that takes hard political work: raising taxes on the rich, on inherited wealth, raising wages, etc. I'm confused about what are "advantages". I'm not sure why culture, that is, music lessons, are an advantage, from a conventional point of view. From a conventional point of view, power and money (which buys the power of having good lawyers, good accountants, good doctors, faster computers, etc.) are advantages. I can think of lots of arguments about why culture is a good, but that something is a good does not necessarily make it an advantage in the conventional sense. Let's say my son never had music lessons. He probably would have ended up being a lawyer or corporate executive or an entrepreneur, like most of the kids he grew up with, people who make a lot more money than a musician and thus have more conventional advantages. It's not music lessons (or their cultural equivalent) or bedtime stories which give a child the possibility of conventional advantages in life, it's first of all, genes and second, growing up in a household where people discuss complex isses at the dinner table with a large vocabulary, read books and in general, stimulate the child's mind through their daily interactions with her. Let's say my child has an interest in philosophy and since I have lots of money, I hire top philosophers like Peter Singer, Michael Sandel and Jean Kazez to tutor her. She learns good reasoning skills, which she could put to use as a corporate lawyer advising multinational companies how to avoid environmental regulation in the third world or as a future philosopher (not a well-paid profession) or as an activist in Occupy Wall Street, since thinking about our society is likely to lead one to the conclusion that it is very unjust. In fact, all of the radicals I've known and know come from privileged families where arguing politics and discussing issues was frequent. From what I can see, this idea is just going to lead a few guilt-ridden progessives to deny their kids things that "all the other kids" have, which will produce family friction. I don't believe that parents have the right to experiment with their kids' lives, although they have every right to experiment with their own. I think a more reasonable way to formulate a guideline is that one should not do things for one's child if the sole intent is to give her an advantage over others. So, paying for music lessons because it gives her an advantage in college admissions- no; paying for music lessons because you think that playing an instrument is life-enriching- yes. Brighouse and Swift advocate levelling down - denying the best possible education to one's child out of fear they may gain a competetive advantage. This then means that that child makes less contribution to society, to the disbenefit of all. Far better to level up as far as possible, by improving education, offering parenting classes and early years childcare.